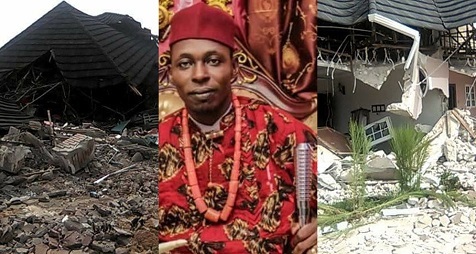 The Federal Government yesterday demolished a multi-million naira mansion at Omoku, in the Ogba/Egbema/Ndoni Local Government Area of Rivers State, belonging to the slain Niger Delta militant and notorious kidnapper, Don Waney. Southern City News learnt that the house was bulldozed under the watch of heavily-armed security agents, who mounted guard at different angles of the militant’s palatial home. Waney and two members of gang were shot dead on Saturday in Enugu State by a combined team of soldiers and operatives of the Department of State Services. A resident of the area, who identified himself as Ukandu, said that the bulldozers came in on Tuesday morning after over 15 Hilux vehicles had brought in security operatives, including soldiers and policemen. Ukandu explained that the security agents took position in different parts of the mansion and outside, in the bush, ostensibly to stop any intruder from obstructing their operation. He pointed out that the demolition, which began in the morning hours, ended in the afternoon, adding that the entire building was reduced to rubble. “Nobody was allowed to enter the place, especially those who wanted to take photographs of what was going on. More than 15 Hilux vehicles brought in security agents and after that, six bulldozers came in and brought the building down,” Ukandu said.